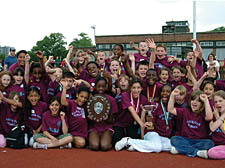 REIGNING champions Gospel Oak continued their record-breaking run in the Camden Primary Schools Athletics Championships after winning the title for the ninth year in a row. Track and field stars from the school in Mansfield Road won almost all of their events at Parliament Hill Fields as they finished 105 points ahead of their closest rivals. Organised by the Camden Schools Sports Association, the tournament was bigger than ever as hundreds of youngsters from 15 different primary schools battled it out. After a day of thrilling action, top honours yet again belonged to Gospel Oak – the only school to have won the competition since St Aloysius last took the title back in 1999. Just three points separated the next four schools, with Primrose Hill finishing second with 82 points, New End taking third place with 81 points and Hampstead Parochial finishing fourth with 80 points.